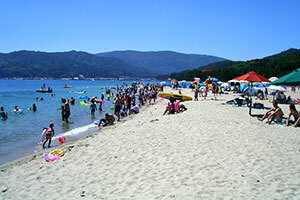 Amanohashidate is a long sandbar 3.6km (2.2 miles) in length, 20m to 170m (70-560ft) in width, covered by 5,000 pine trees. Compared to a divine bridge, it has been a poetic motif since ancient times. Stone slabs inscribed with haiku or tanka poems written by great poets and even the Emperor dot the sandbar, so that visitors can hear the words of their ancestors. Amanohashidate, cutting the Aso Sea off from Miyazu Bay, is often said to look like a dragon flying up to heaven. 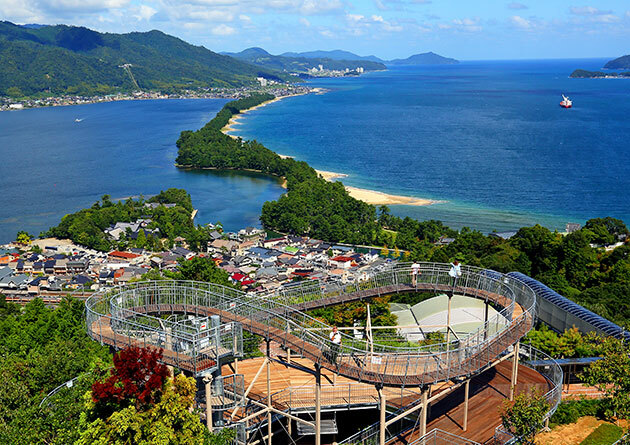 Three observatories are set around Miyazu Bay so that visitors can enjoy three different views of Amanohashidate. An observatory on Mt. Monju to see Amanohashidate from the south. This view is called Hiryukan, meaning "Flying Dragon View." The ferris wheel and cyclecars on top of the mountain are particularly popular with small children and elderly people. Amanohashidate Sesshu’s View Point An observatory to see Amanohashidate from the east. This view is called Sesshukan, because of its similarity to the national treasure painting “Amanohashidate-zu” by Sesshu (1420 - 1506). The observatory is a 5 minute walk upstairs and is especially beautiful when the sun sets behind the mountains. A part of the bridge rotates 90 degrees so that ships can pass and connects Amanohashidate to the land near Monjudo. Built in 1923 to be manually rotated, it became electric-powered in 1960 due to the increase in ship traffic. It now rotates up to 50 times a day and is the best photo and video spot for visitors. 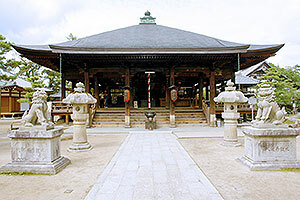 This is an old temple for Monju (Manjushri) and 500 years ago was depicted in the picture “Amanohasidate-zu.” Monju is well-known as a symbol of wisdom, and it is said that three peoples' collective thinking match Monju’s wisdom. Today many visitors gather here hoping for good luck with schoolwork and other tasks. Chionji has many features, like its Tahoto, meaning "pagoda with many treasures," which has been designated as a National Important Cultural Property. This temple is on the mountain a little further up from Kasamatsu Park. 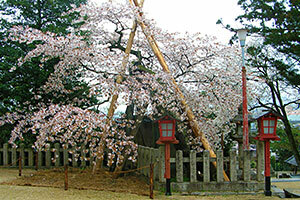 It is the 28th of 33 Saigoku Kannon Pilgrimage Temples, and is said to have been founded in 704. 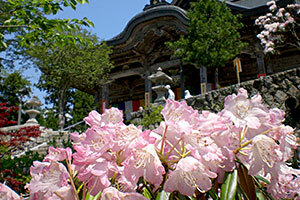 The temple's principal image is the Beauty Kannon, but also features the "Unringing" Bell, the Front-Facing Dragon, a Five-storied Pagoda, and beautiful rhododendron flowers. 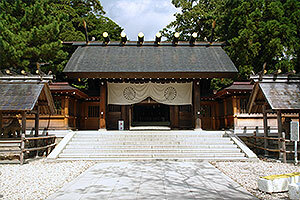 This is an old shrine to the north of Amanohashidate at which it is said stayed the Gods of Ise Shrine. 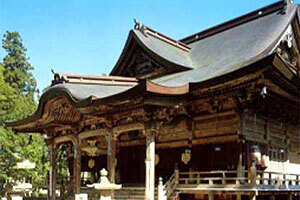 It houses many National Treasures and designated Important Cultural Properties. The Aoi-matsuri Festival on April 24 has a long history, and its tachi-furi sword swing dance has performed for a thousand years. 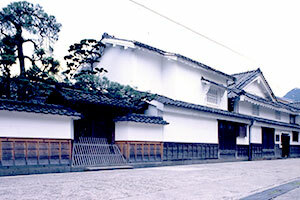 This is a very large merchant house from the Edo period and is a National Important Cultural Property. The Mikami family businesses were brewing, shipping, and yarn wholesale, but they were also involved in the Miyazu Domain finances. The beautiful white color of the main buildings comes from a plaster that protects against fires. Historical, folkloric, and archaeological displays as well as art and craftworks of the Tango region are on exhibit. Exhibitions are seasonal and include a special exhibit in the autumn. 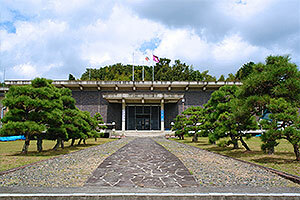 Outside of the museum is another viewing spot of Amanohasidate, which also features the site of the Tango Provincial Temple (Kokubunji) and former residence of the Nagashima Family, the head regional administrators of the late Edo period. 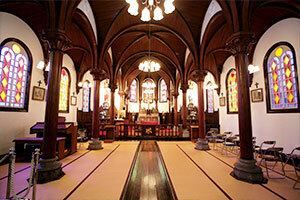 This Catholic Church was built in 1896 and is said to be the second oldest in Japan. Its stained glass windows and tatami floors are prime examples of its unique style that blends Romanesque and Japanese aesthetics. Father Relave (J.Louis, 1857-1941) from France founded this church, and Mass is still held each Sunday. This cherry tree is over 400 years old, and blossoms gradually change from white to red before drifting away in the wind. Over 1,000 of these rhododendron flowers will be in bloom from the middle to the end of April. 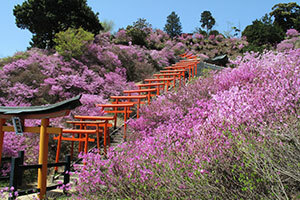 About 1,000 pink azalea are growing together surrounding vermilion torii gates lined up on the mountainside. Shotenkyo is the entrance to Amanohashidate, and is joined to the land by a rotating bridge. 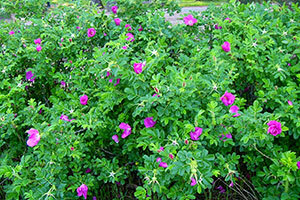 This location is also called the "Beach Rose Path." 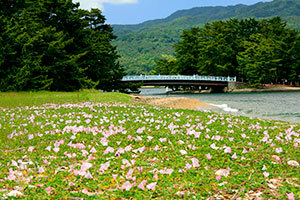 These light pink morning glories bloom from May to June in the Shotenkyo area. 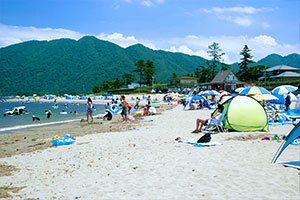 Visitors can enjoy the green pine and white sand beaches of Amanohashidate. Families gather here for the gentle waves of the sea and the deep green shade of the trees. Relax after swimming near the station at Chionji Temple, Amanohashidate View Land, or the spa Chie no Yu, meaning "waters of wisdom." MAP P7 minutes walk from Amanohashidate station. 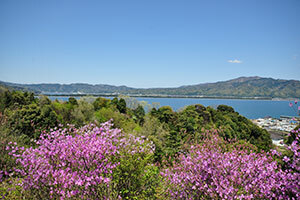 10 minutes by car from Miyazu-Amanohashidate IC, through national route 178 and local route 2. 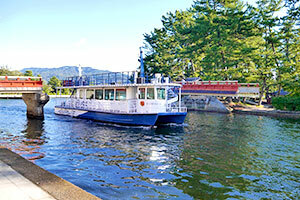 Nearby is the Ichinomiya (一の宮) Pier from which depart sightseeing ships, Kasamatsu Park, and Moto-Ise Kono Shrine. MAP Q5 minutes walk from Ichinomiya Pier. 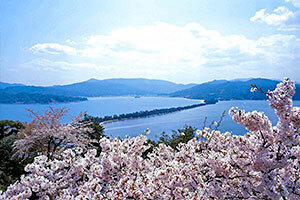 20 minutes by car from Miyazu-Amanohashidate IC, through national route 176 and 178. 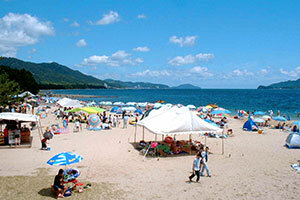 This is a 2km (1.2mile) long, white sand beach with a shallow, clear sea. The nearby Mt. Yuragatake is also called Tango-Fuji because of its shape. 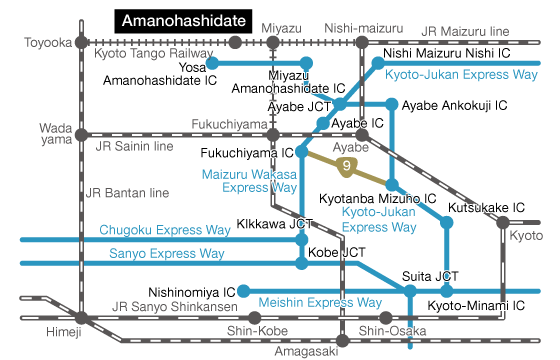 MAP R7 minutes walk from Tango-Yura station. About 10 min. from the Miyazu Amanohashidate IC on the Kyoto-jukan Expressway. About a 5 min. walk from Amanohashidate Station on the Kyoto Tango Miyatoyosen Line. This red bridge connecting Amanohashidate to town rotates 90 degrees to allow ships to pass.